Clarence may have sung the song during these various stops. If he did, the townsfolk took the song and put their lyrics to it to make the song their own. Since there was no TV, radio or even roads in those days, the story was spread in song through the railroads, where workers were singing in unison while pounding the spikes into the ground. As with many details surrounding the group, the song and its derivation, the facts are often contradictory, perhaps as time has faded the memories of those involved. Such is the case of the first time the different members of the group heard what was to become The House Of The Rising Sun. According to John Steel, “The song was first introduced into our crowd in Newcastle by a friend of mine called Bill Davison, the first guy to get the Bob Dylan album in 1962. No matter what Eric claims, that was the first time we ever heard The House Of The Rising Sun.” (4) Burdon states he first heard the song in 1957 when performed by British folk artist, Johnny Handel. 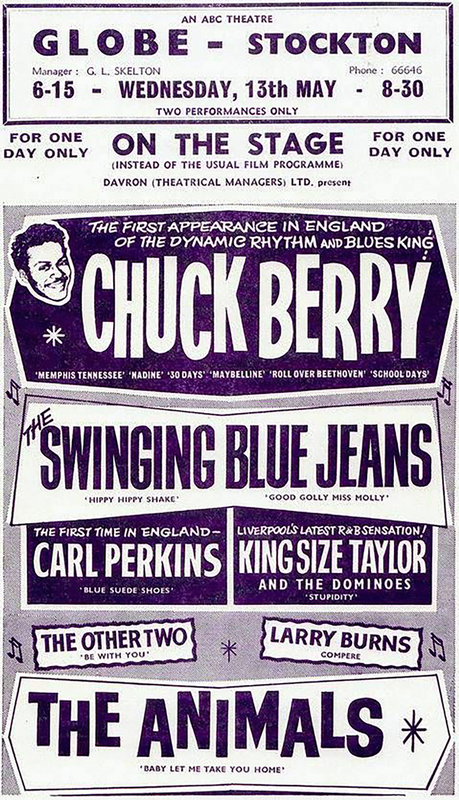 One of the tour posters from May of 1964. Then there were other problems, including one that the song was too long. “Dave Siddle, the engineer, turned to Mickie and said, ‘We’ve got a problem here. It’s four-and-a-half minutes.’ Mickie to his credit said, ‘Oh, the hell with that. We’re in the vinyl age now!’” Steel added. Burdon once commented the song was such a big hit that it was a tough act to follow. (8) Perhaps it was. There was another problem on the horizon that would lead to the group’s breakup in May of 1965. Hilton Valentine remembers it well. “We were in a rehearsal studio in London when manager Mike Jefferey came in and said it was too long to put “Trad. Arranged by”… with all our names on the record. And we’ll sort the division of the money out later.” (4) That later never came. Alan Price was the only name credited with the song. The issue festered for a number of years but the members of the original group tried one more time to correct the distribution of the writing royalties. Burdon stated, “Many  years later, on the ’83 Animals reunion tour, Chas Chandler called a meeting. He proposed that all the royalties from that day on be shared among the original members. Alan Price’s reaction was ‘Go **** yourself,’ or words to that effect. He got up and left.” John Steel mentioned, “It rankled more with Hilton and Eric than anybody else. Eric still explodes about it. And I know it ate away at Hilton for a long time.” To this day, Alan Price receives all writer royalties on The House Of The Rising Sun. 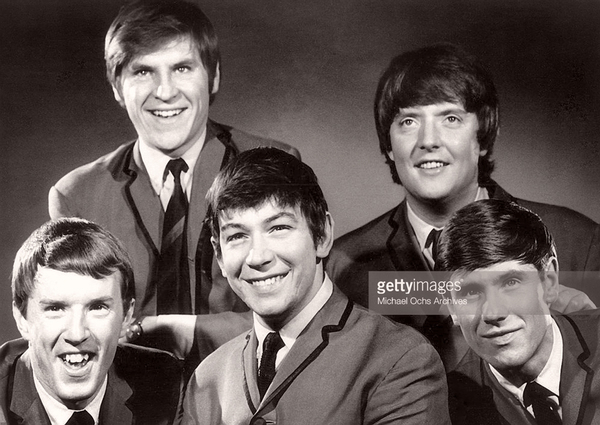 The Animals - 1964 L-R: John Steel, Alan Price, Eric Burdon, Chas Chandler and Hilton Valentine. Photo courtesy of Getty Images/ Michael Ochs Archives. Was there ever an establishment in New Orleans that inspired the lyrics to this song? Depends on whom you ask. If you were to ask five different locals in New Orleans, there’s a chance that you would get five different answers. Also, it would be difficult to determine if the House of the Rising Sun existed, as the term may have been one of many euphemisms to describe a house of ill repute. Still, there were establishments that existed referencing the name Rising Sun. The following paragraphs from The House Of The Rising Sun – the History and the Song from the website The Hitchhiker’s Guide to the Galaxy – Earth Edition best tell the story. There is a house located at number 826-830 St Louis Street in the French Quarter of New Orleans which is current owners claim is the famed, former House of the Rising Sun Brothel, originally run by a Madam named Marianne LeSoliel Levant (whose surname translates from French into Rising Sun), from 1862 through 1874. The owners, however, can offer no solid proof of this claim. Newspaper advertisements in 1838 also mention a Rising Sun Coffee House on Decatur Street in the city, but this establishment never had a claim of fame as a brothel or gambling hall, and it is no longer in existence. There was a Rising Sun Hall in the 1890s, which served as a 'benevolent association' hall; it booked dances and rented rooms to musicians. These halls and clubs were the very birthplace of jazz. It is conceivable that prostitution and gambling occurred in the backrooms of these halls, with the constant transience of travelling musicians. This is purely speculation though, as no oral or written history exists about these goings-on. In the early 1800s there was The Rising Sun Hotel, located on Conti Street in the heart of the French Quarter. During its time of operation, the hotel was sold to new owners. In January 1821, an advertisement for the hotel in the Louisiana Gazette states the new owners will 'maintain the character of giving the best entertainment, which this house has enjoyed for 20 years past.' In 1822, the hotel burned to the ground, and was never rebuilt. The earliest recorded version dates back to September 6, 1933 by Clarence 'Tom' Ashley and Gwen Foster as Rising Sun Blues. Though The House Of The Rising Sun was originally recorded in mono, this video presents a digitally extracted version of the song. 1) Sullivan, Steve, Encyclopedia of Great Popular Song Recordings, Volume 1, October 1, 2013, Page 98. 2) h2g2, The Hitchhiker’s Guide To The Galaxy: Earth Edition, House of the Rising Sun, the History and the Song, July 28, 2006, Link. 3) Wikipedia, The Animals, Link. 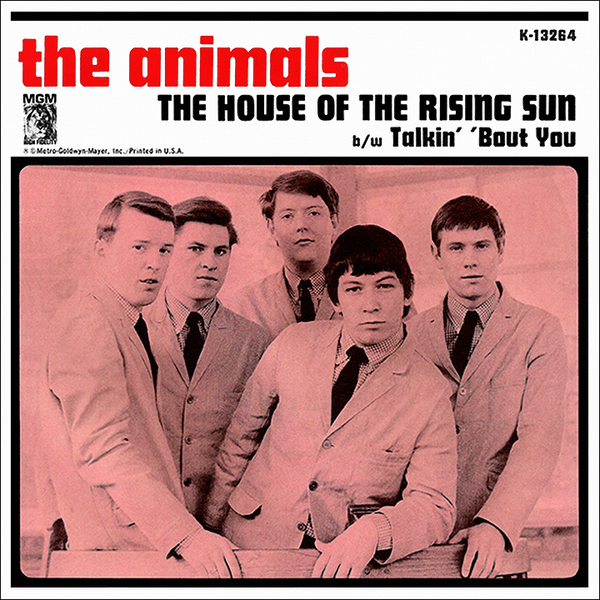 4) Hasted, Nick, Uncut, The Making Of… The Animals’ The House Of The Rising Sun, March 25, 2013, Link. 5) Anthony, Ted, Chasing the Rising Sun: The Journey of an American Song, July 13, 2007, Pages 142-155. 6) Whitburn, Joel, Top Pop Singles 1955-2002, Page 19. 7) Whitburn, Joel, Billboard Hot 100 Charts The Sixties. 8) Bessman, Jim, Liner Notes from The Animals Retrospective, 2004. L-R: Chas Chandler, Hilton Valentine, John Steel, Eric Burdon and Alan Price. Photo courtesy of mediocrates posted Album Art Exchange.